Once an order has been placed you are accepting all terms and conditions as discussed below. On placing an order a 20% deposit will secure you booking. If you are wishing to collect your Cake, half of the remaining balance is to be paid 4 weeks before, with the remaining half to be paid on collection. If you are wanting delivering, then half of the remaining balance is to paid 4 weeks before, with the remaining being received in full 7 days before delivery. If you wish to cancel your order a full refund will be given within 14 days of the initial date of the order, providing that no costs have already been occurred. If your event needs to be rearrange Jackie will endeavour to meet this new date if work load allows. In the unlikely event that Jackie has to cancel due to ill health or fire etc, a full refund will be given. At the time of ordering all details will be agreed and a written contract is to be signed by Jackie and her customer's. If after your initial consultation you wish to change any of these details this must be put in writing and agreed by both parties. Additional costs may be added if needed. Every effort will be made to accommodate food allergies. However, even though the allergic ingredient can be removed from the Cakes, Jackie's Cakes if a fully functioning kitchen where all ingredients are used and therefore cannot guarantee that the Cake will be 100% free from any traces of the food allergy. Any inedible item used on the cake will be made aware to the customer. It is the customer's responsibility to make sure others are aware of these items. On collection all advice will be given to help transport your Cake and the correct packaging will be supplied. However, any damages that happen after the Cake has left the premises are the responsibility of the customer. To ensure the freshness of your Cake it is advised to collect the day before your event or if possible the day of your event. If the Cake is to be delivered and set up, please ensure the correct person is there to check the Cake and sign for delivery. After this the Cake is the sole responsibility of the client. the arrangements for the cake table. When cutting the Cake for photos it is advised to cut the bottom tier, unless it is a dummy layer then use the cake tier above. 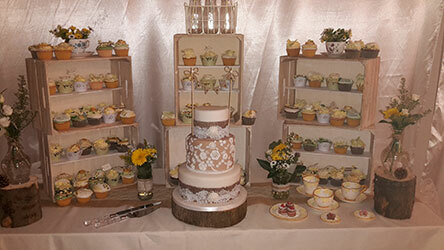 As each cake is handmade and hand crafted there may be small variations to the picture provided. Please try and allow as much time as possible when booking as Jackie limits her work load to ensure that excellent standards are maintained and all cakes are hand crafted.